Palestinians are being denied medicines in prisons equipped by the Western corporations G4S and Hewlett-Packard, according to a new report by the organization Corporate Watch. The Anglo-Danish firm G4S provides the bulk of surveillance equipment used in Israeli prisons and military checkpoints. 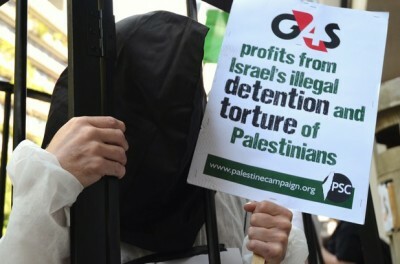 In 2012, organizations campaigning for Palestinian prisoners called for the boycott of G4S until they ended all contracts with the Israeli Prison Service (IPS). The Corporate Watch report is based on interviews with eleven Palestinians from the occupied West Bank and Gaza who were formerly incarcerated by Israel. Corporate Watch also draws attention to the contributions that Hewlett-Packard makes to Israeli prisons and the Israeli Navy, providing them with most of their information technology infrastructure. The Israeli Navy is responsible for enforcing the maritime blockade of Gaza, shooting fishermen within a short distance from the coast. There are now 6,500 Palestinian prisoners in Israeli jails: 454 are being held indefinitely and without charge under administrative detention and 200 are under the age of eighteen. In contravention of the Fourth Geneva Convention, Israel transfers Palestinians from the occupied West Bank and Gaza to seventeen different prisons located inside present-day Israel. An estimated 1,000 prisoners are currently sick and in need of medical attention, but prisoners consistently report woefully inadequate care. “Painkillers and drinking water are the only solutions they give medical problems,” a prisoner from Beit Hanoun in Gaza told Corporate Watch. For many interviewed, the reason for their arrest was unclear, arbitrary or seemingly immaterial to their severe sentences. Ghada, a young woman from Ramallah who volunteers with the prisoners’ rights group Addameer, was arrested in the middle of the night and detained for 26 days for what she deduced from her interrogation was her involvement with a prisoner solidarity page on Facebook. Another interviewee was sentenced to seven years for allegedly intending to assassinate Ovadia Yosef, the spiritual leader of Shas, a religious party in Israel. The only evidence Israel had was that the man had driven past Yosef’s house in Jerusalem. Akram Salah was sentenced to thirty years for merely being a member of Hamas. But Fatima al-Zak knew exactly why she was arrested by Israeli soldiers at Erez crossing, which separates Gaza and present-day Israel, in 2007. She says she was on her way to commit a suicide bombing targeting Israeli soldiers and army recruits. It wasn’t until after she was arrested that she discovered she was pregnant. Her prison doctor requested that her hands and legs remain shackled during her regular checkups with him. She was only allowed to deliver her baby without shackles after protesting to the Red Cross. As soon as her baby son was born, he was taken from her, and the shackles were replaced around her ankles. For the next three days, as al-Zak recovered in the prison hospital, she was only permitted to see her baby, Youssef, for ten minutes, three times a day, when she could briefly breastfeed him. After the first three days, Youssef joined his mother in her prison cell with three other women at HaSharon prison. There, he spent the next 21 months of his life. Fatima and Youssef were released in October 2009 as part of an exchange between Hamas and Israel in which twenty Palestinian female prisoners were released in return for a video of the captured Israeli soldier Gilad Shalit. In addition to being a central target in the campaign for boycotting and divesting from companies that abet Israeli apartheid, G4S has come under increasing attack for a litany of abuses in other countries. A British law firm recently sued G4S for its alleged involvement in the torture of prisoners in South Africa. In 2011, G4S promised it would not renew any contracts that involved the Israel’s wall in the occupied West Bank. And last year, the company announced it would not renew those contracts in the West Bank, including its contract with the Israel Prison Service. However, activists are wary of taking G4S at its word. Hussam, a prisoners association in Gaza, has called on Arab and European human rights organizations to put officials of the G4S company on trial for its complicity in war crimes.